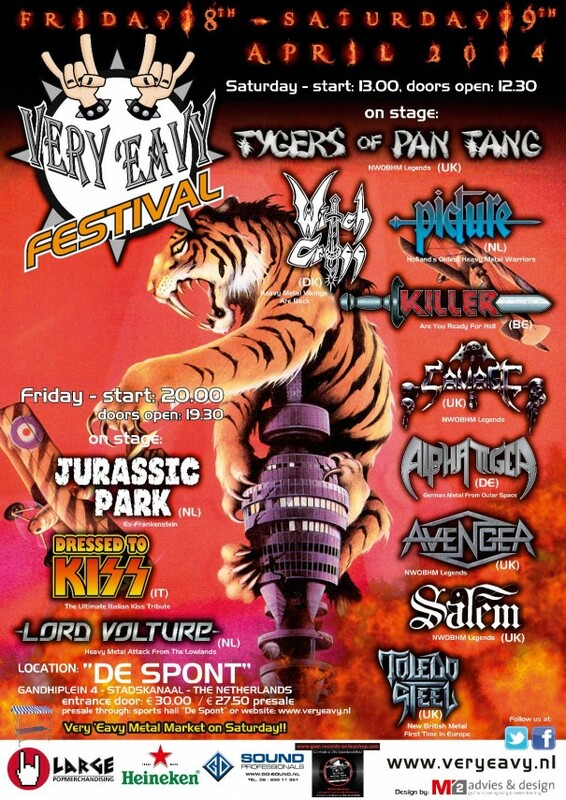 The annual Very ‘Eavy Festival is one of the fastest-growing Metal festivals on the Dutch soil. The thing that makes this festival – especially in the Netherlands – so special, is the fact that this is one of the few events that solely concentrates on booking old school Metal. Last year the festival made huge progress by taking things to a bigger level. Traditionally on the Easter weekend it is time for the fourth edition of the festival in the small city of Stadskanaal in the Dutch Northern Province Groningen, which thanks to its strong line-up is as good as sold out. One thing is clear: Very ‘Eavy is here to stay and will soon be able to match festival like Headbangers Open Air and the legendary Keep It True. Dutch Heavy Metallers LORD VOLTURE have the privilege to open this edition of the festival. These guys have been around for some years now and have already released two good album. The band is often on the road and to be seen on European stages, but surprisingly enough the band has never played in the Dutch northern region Groningen, which is about to change tonight. At the moment the band hit the stage there aren’t that many people in the hall, but that doesn’t stop the band from blazing at full speed, and represent their traditional Heavy Metal as enthusiastic and as tight as one is used from them. The band is very much in its element, and vocalist / frontman David Marcelis is simply in top shape. He manages to win the crowd and have them participate in the show with ease. The setlist is mainly in the sign of the most recent record, “Never Cry Wolf”, but in “Line ‘Em Up” the band also presents a new track from the upcoming album. And if the rest of the material is as strong as this track, then I can already say that we’re about to get a blast of a record. Naturally the magnificent “Hearts Of Steel” from the debut “Beast Of Thunder” is the closing song, and we can look back on a successful live debut on the Groningen soil. I’m quite fond of Canadian youngsters IRON KINGDOM on CD, and so I was really curious about them live. As soon as the quartet takes off with ”Crowned In Iron” after the intro, I find myself having my fist up in the air and headbanging fanatically. Just as it is the case with al bands on the festival, IRON KINGDOM can count on a good sound, due to which their catchy riffs blast out even stronger and grab you by the throat. Singer / guitarist Chris Osterman is in good shape, comes across strong, and can hit all the high notes live as well as on the record. After “Guardian Angel” the band immediately presents a new track in “Ride For Glory”, which fits perfectly to the band’s current repertoire. The setlist choice is excellent and we get “Egypt (The End is Near)”, the fantastic “Legions Of Metal” (my personal favourite), “Voodoo Queen”, and finally “At Home in the Dark”. The audience unfortunately is quite unfamiliar with this band and acts rather reserved, but the band can count on an enthusiastic reception, and look back at a successful debut in the Netherlands. After IRON KINGDOM we get very special “band in between”. Indeed ladies and gentlemen, in BURNING festival organiser Hugo Koch has a brand new band, With that band he has just released the 7” debut single, “Something Is Lurking In The Dark”, along with the TYGERS OF PAN TANG, “Killers” (which is the B-side of the single), which he now presents live on stage. Koch and co. are no strangers among the locals, so the interest in this special gig is quite grand. The old school Heavy Metal from BURNING – of course – fits perfectly to this festival and the band plays a tight and convincing set, and can count on a warm and enthusiastic reception from the audience. The gentlemen still have some work to do about their podium presentation, because except for Koch himself the rest of the band is quite focused on their instruments the entire time. But one thing is certain; we will hear more from this band. The vibe and the atmosphere is quite well and is about to get even better, because the Italia KISS cover band DRESSED TO KISS is about to hit the stage an treat us on a set of KISS classic, and my god do they do it well! The band makes a tight and strong start with the magnificent “Creatures Of The Night”, and they party is immediately a fact. It also seems that almost all attendants have placed themselves in the hall to witness and enjoy this band. And there is much to enjoy with a set containing of songs such as among other. “Deuce”, “Shot It Out Loud”, “Psycho Circus”, “Love Gun”, “Hell Or Halleluja”, “2000 Man”, and of course “I Was Made For Lovin’ You”, “Rock N Roll All Night”, and the encore “Detroit Rock City” cannot be missed. I must say that the band presents these classic quite well and the gentlemen play their rolls as they should. The band has little possibilities for show elements, but make good with their tight playing. Also the vocals are quite similar to Paul Stanley’s, and sometimes I really get the idea to be listening to the real thing. Shortly put, a fantastic show from this party band and I certainly hope to witness them live again someday. I must say however that this band doesn’t play as headliner. After the fantastic DRESSED TO KISS spectacle it’s time for the Dutch veterans JURASSIC PARK. Unfortunately there are some technical problems with the power on stage, causing a huge delay. Almost one hour later than planned the band hits the stage around 01:00am, and seeing that I’ve had a long working day behind, and the fact that we have full day of Metal tomorrow, I decided to call it a night. My apologies, gentlemen. Traditionally the Saturday is being opened by the winner of the Very ‘Eavy Battle, which was held in October, and won by noise-commando MANIAC FORCES, from the Limburg province of the Netherlands. Although the idea of the festival is to embrace old school Metal (except for Black Metal that is), and so there is also room for old school Thrash / Crossover bands like this, I find this band a bit misplaced. The gentlemen definitely play a tight set and have a good podium act, and they also have a reasonably strong repertoire and their aggressive tones are definitely worth, but early in the afternoon it all doesn’t ignite the spark and the band performs for a handful of fans. That however doesn’t stop them from going ballistic and put on an energetic show. The British TOLEDO STEEL after that is the surprise of the festival for me. I had never heard of this band before, but having witnessed the fantastic performance from this young quintet, I must say that I’m sold! No, there is nothing original or shocking about this band, but simply honest old school NWOBHM. The gentlemen impress with their good songs, excellent podium presentation, tight playing and a fantastic vocalist. This band is yet in the demo/EP phase, but still they are much further than most signed bands. It wouldn’t surprise me if this band – hopefully – scores a record deal soon. According to what I’ve seen and heard today, as far as I’m concerned we can speak of a new sensation in this genre. The likewise British SALEM is also not that well-known among the Very ‘Eavy crowd. This band was active in the period 1980-1983, and released a couple of demos in those days. In 2010 the band re-joined forces, followed by a compilation, several EPs, and finally released its first long player, “Forgotten Dreams” in 2013. The classic Hard Rock / AOR and NWOBHM from these veterans is timeless and still has as much power and impact as in the glory days. Salem is in good shape today and rocks with the oldies such as a.o. “Fool’s Gold” and “The Other Side Of Hell”, but also the beautiful “Ask The Lonely” from the LP. Vocalist / frontman Simon Saxby is also in top shape today and introduces the songs with typical English humour, which unfortunately doesn’t really impress most of the down-to-earth Groningers. Later this year the band will tour with VORTEX, WIZARD and JAGUAR, and I hope that the can then count on a warmer and more enthusiastic feedback. In AVENGER we have the third British band of the day, and it is obvious that a lot of the attendants have also come to the festival fort his band. It is quite crowded in front of the stage and the fans wait impatiently to see this semi-legends, who are about to hit the stage with the returning vocalist, Ian “Swifty” Swift. As soon as the band breaks loose with “Deathrace 2000” from the 1984 debut “Blood Sports”, the fans go ballistic and the front turn into a tornado of sweeping hair and fists in the air. A set full of classic from the band’s two LPs follows, with a.o. “Enforcer”, “Under The Hammer”, “Run For Your Life” and the fantastic “You’ll Never Take Me (Alive)”, and the fans remain loyal to the band ‘till the last second. The band is in good shape and plays the tracks accordingly, but the point that I dislike is that the band makes a bit of an arrogant impression. Especially Swifty seems to obviously feel like he’s “the man”. All in all a good show. The young headbangers from ALPHA TIGER have been going fast since the release of their second long player, “Beneath The Surface”, and they definitely deserve it. On the record I find this band very strong, but unfortunately I hadn’t had the chance yet to see them live. The show from the Teutonic quintet was therefore one that I was most looking forward to on this festival. Fortunately the band doesn’t disappoint even for a second ad the old school, typically 80s NWOBHM from the men is live as impactful as on the record. I mean, not only do these gentlemen have fantastic songs such as “From Outer Space”, “Waiting For A Sign”, “Crimson Desert” and “Lady Liberty” (from the same-titled last EP), but present them with the fitting stage outfits and excellent stage act, which makes the nostalgia complete. Vocalist Heiko deserves a bit of extra attention because of his fantastic performance, and the fact that despite his active stage act and not too easy vocal lines doesn’t drop any stitches whatsoever. Definitely one of the best shows of this edition of Very ‘Eavy. After that it’s time for yet another British act, the veterans from SAVAGE. I must honestly admit that I have never really followed this band and know the hard-rocking NWOBHM from these gentlemen only sporadically. Completely exhausted after the fantastic gig from ALPHA TIGER I let SAVAGE’s show flow over me quietly. These men also have a less busy stage act than the previous band, which is a bit alienated at first. That however doesn’t mean that the gentlemen don’t present themselves without enthusiasm and definitely do a good show. Unfortunately it doesn’t give me the kickstart I need. Also the show from Belgian legends KILLER was one of the shows I initially looked forward to a lot, and fortunately the band around singer/guitarist Shorty does exactly what one can expect them to do. Already from the first second of the classic “Wall Of Sound” from the same-titled second LP from 1982 the band convinces to the full with their heavy/speed metal. The band also seems to be quite aware of what the fans want and plays mainly old material such as a.o. “Shock Waves”, “Touch Of Evil”, “Bodies And Bones” and “No Future”. With full enthusiasm and super tight KILLER fires the songs towards the fans and Shorty announced them together with a quite strange sense of humour. And the fans simply love it all and give the band the applaud and recognition they deserve. Danish WITCH CROSS is again such a semi-legendary band that was mainly active in early 80s and which was brought back to life a couple of years ago. I can definitely appreciate the band’s old school Hard Rock / Heavy Metal and also the second LPs, “Axe To Grind” from 2013, applied to me well. However, after a killer show from Killer, the performance from these Danes is a bit of an anti-climax for me. I’m not saying the band does a poor show, and it has definitely nothing to do with the setlist. It’s just that also Witch Cross doesn’t manage to ignite the spark. All in all not a bad show, but definitely not one of the best of this edition. Dutch legends PICTURE have definitely deserved their position as co-headliner, and honestly I wonder why they haven’t gotten the headlining position! I can be quite short about the show from these giants in Dutch Heavy Metal, because Picture shows everyone how a Heavy Metal show should be done, and definitely gives away the best performance on Very ‘Eavy 2014. The band is very much in its element and plays with audible and obvious joy and enthusiasm, and are simply in top shape. The last one also goes for the charismatic vocalist / frontman Pete Lovell, who sings as loud, clear and strong as ever. With classics such as a.o. “Diamond Dreamer”, “Heavy Metal Ears”, “Lady Lightning”, “Message From Hell” and of course “Eternal Dark” the setlist doesn’t leave much to be desired either. The more recent tracks like “My Kinda Woman” and “Warhorse” from the same-titled last album do as well, and the band needs no trouble at all to get the fans going crazy. Without doubt the band of Very ‘Eavy 2014. After the fantastic performance from Picture I honestly don’t even need to see headliner TYGERS OF PAN TANG. Don’t get me wrong, I mean, being a big fan of the MWOBHM I can definitely appreciate this band and have outmost respect for them, but at the same time I’ve never been a huge fan. Just like their colleague compatriots AVENGER, the TYGERS OF PAN TANG come across a bit arrogant, which does kill the joy a little bit for me. The majority of the audience clearly thinks the opposite and watches the show with outmost interest, and sings along with every song with full force. I personally keep my distant and remain neutral, and enjoy the afterglow of PICTURE’s performance. At precisely one minute to midnight the TYGERS OF PAN TANG wrap up, yours truly start celebrating growing older by putting some extra pressure on the liver, and we can look back on another absolutely successful edition of the Very ‘Eavy Festival.